Some music seems to exist in a world of its own, a place where it came into being spontaneously because it had to exist. 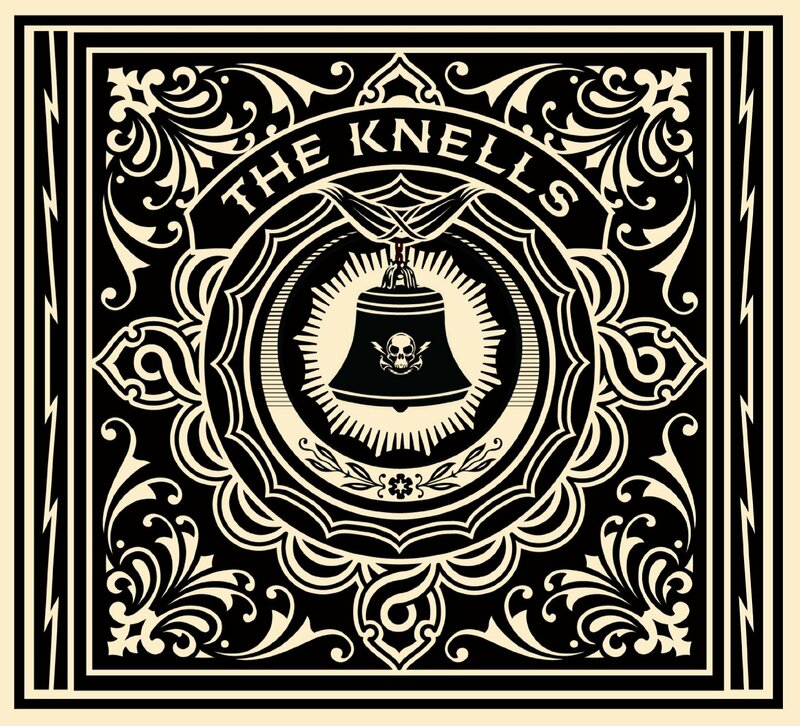 The Knells sounds like that to me, music that is somehow not quite part of our normal world. All of the elements of the music, the three female vocalists, the two guitars, the string section, and so on, are part of our world, but the end result of their combination seems otherworldly. Of course, it's grossly unfair to composer Andrew McKenna Lee to suggest that his art came into being by itself — I'm sure he worked long and hard to put it together once the initial idea came into his head, not to mention the years of study and practice that made the work possible. The first track starts with a somewhat off-kilter guitar part full of dissonant chords and unusual voicings, then the second guitar, bass, and drums come in and for a time The Knells sound like a relatively normal instrumental rock band. But at the two minute mark, there's a brief moment of calm, and the singers come in. Their parts here, as throughout the CD, are arranged very nicely, sometimes with harmonized chords, sometimes polyphonic counter-melodies, and sometimes with clustered intervals a bit reminiscent of the mysterious Bulgarian voices. One of the things that strikes me about the singing is that there is virtually no vibrato used, even on long tones. While I'm not generally a fan of over-dramatic operatic vibrato singing, the pure tones used here can be quite brash, giving the singers a bit of the sound of being sampled on a keyboard. It's pretty rare in the arrangements that a single voice appears unaccompanied by the other two, so some of the intimacy of individual expression is lost. But those are minor observations, not criticisms. The two guitars are great together, with a variety of different sounds, sometimes with interlocking melodic parts, sometimes one playing chords and the other melody, sometimes providing atmospheric effects. The string arrangements are similarly varied, not just serving as keyboard replacement. These parts are really interesting in their own rights, and an integral part of the music. Mallet percussion appears from time to time, providing even more sonic variety. All in all, this is an impressive debut, and an example of musical ambition backed by both the talent and technique to pull it off. The Knells is the recording and performing project of guitarist and composer Andrew McKenna Lee. The ten compositions here represent a formidable body of work, highly original in many respects, and clearly ambitious. Lee’s ensemble includes four instrumentalists (bass, drums and two guitars, including himself), three female vocalists (I want to say Choir, as this is the mode they operate in), and a five-piece string ensemble. I could almost swear I hear some other instrumentation in the mix (primarily woodwinds and horns), but I see no credits, so there you have it. There are a couple instrumentals here, and some lengthy song introductions, mostly softer introspective interludes that offer a respite between the grandiosity of the major cuts where all the players and singers are engaged. Lee is an amazing and inventive guitarist, and does get many chances to shine throughout, borrowing influence from everything from classical to blues, but that’s a lesser aspect of their big, all encompassing sound. Most of the pieces are slower paced, sort of like a heavy shoegazer sound mixed with an influence of mid-period Pink Floyd and some happenstance Robbie Krieger-like psychedelicisms, but more than anything, it’s the massed choral vocals that set this apart from just about anything else out there that one might hear. The singers seem constantly engaged in amazing wordless harmonies and brilliant counterpoint, occasionally backing off to allow one or another singer step out front. There are lyrics, but for the most part they are difficult to follow without the lyric sheet that has been kindly provided in the booklet. Although it may take a few listens to get tuned into The Knells wavelength, patience rewards; this is, more than anything, unique. The Knells is Brooklyn-based Andrew McKenna Lee’s musical project combining elements of Renaissance madrigal singing, 20th Century classical music, jazz, and progressive rock. The Knells ensemble consists of soprano Nina Berman, mezzo soprano Amanda Gregory, alto Katya Powder, guitarist and percussionist Andrew McKenna Lee, guitarist Paul Orbell, drummer Michael McCurdy, and bassist Joseph Higgins. In addition, the Mivos String Quartet (Olivia de Prato on violin, Joshua Modney on violin, Victor Lowrie on viola, Mariel Roberts on cello, and Isabel Castellvi on cello) joins in on several tracks. This is an interesting concept, but somehow it doesn’t all come together for me. I find the instrumental passages to be outstanding, but I have a hard time with the vocals. The lyrics are in English but the vocals are extremely difficult to understand unless you meticulously follow along with the printed word. It all sounds like sterile wordless dissonant singing to me. Plus there is not much variation in the handful of notes they sing, which caused me to rapidly loose interest. The high point for me is the instrumental “Spiral Poem” and the Frippian guitar licks on “Spiral Knells.” The Knells is one of those albums that is best taken in small doses. Trying to listen to it in one go was quite a challenge for me. I applaud Andrew’s attempt to marry these disparate musical elements, but it just did not work for me.